ER Editor: We also recommend a couple of Guardian pieces on this topic, titled Secret court case application numbers more than double in a year and What are secret courts and what do they mean for UK justice? The legal mechanism used in these cases is called closed material procedures (CMP) in which only the judge and security-cleared special counsel can see all the evidence. Defending counsel is thus not permitted to disclose the evidence to her client, who therefore cannot defend himself correctly, and may never know why he was accused in the first place nor why he was found guilty (which is far more likely than being found innocent). As TruePublica notes below, what is accepted as admissible evidence in these types of proceedings is disturbingly loose. It’s also correct to say that the EU does nothing to overturn injustice done in these types of situations, as this 2015 report from ActivistPost makes clear: EU Court Rules UK Secret Court Not a Rights Violation. Which hopefully gives readers who still feel an emotional attachment to this undemocratic Big State, even after its destruction of Greece, pause for thought. This article was first published December 2015. The use of secret courts in Britain has escalated. Against their will, the controversial practice of forced adoption at the behest of social services has faced widespread criticism and yet, over 2,500 children have been forcibly adopted through the use of secret courts. An ex-military intelligence officer has offered to give evidence in secret court hearings about allegations of murders and collusion by the British Army. Two public inquiries, more than 200 judicial reviews and more than 1,000 damages claims against the British Army have largely been heard with secret evidence, including challenges to Britain’s arms sales to countries breaking international laws for their use. The use of secret courts is a place where trials take place that is not open to the public, nor generally reported in the news, and generally no official record of the case or the judge’s verdict is made available. Often there is no legal allegation. The accused is usually not able to obtain the counsel of a lawyer or confront witnesses for the prosecution, and the proceedings are characterised by a perceived miscarriage of justice to the benefit of the ruling powers of the society. This is the stuff of cold war Russia and Nazi Germany – right? Think again. In the English-speaking world, one of the most notorious secret courts was the Star Chamber as it was used under Charles I in the early 17th century. The abuses of the Star Chamber were one of the rallying points of the opposition that organized around Oliver Cromwell, and ultimately resulted in the execution of the deposed king. The term “star chamber” became a generalized term for a court that was accountable to no one (except the chief executive) and was used to suppress political dissent or eliminate the enemies of the regime. The inherent lack of objectivity of politically-motivated charges has led to substantial reforms in English law. Clearly there is something very dangerous and pernicious about secret courts. During the First and Second World Wars, there were a number of spy trials held behind closed doors and the odd one thereafter, but secret trials in Britain is an affront to openness dating back to Magna Carta and have never been used in civil cases. Then came a Conservative Bill called the Justice and Security Bill and was roundly opposed by everyone, literally everyone. That was back in 2013, today we have no idea what cases are being tried in this way. Britain’s alleged complicity in the kidnap and rendition of suspects sent to Libya for torture is an alarming case in point. One only has to imagine a situation where an innocent person is suing the government for damages for torture and kidnap, in one case including that of a wife and 12 year old daughter, then losing the case, without being present or ever knowing the reason why or what was said. Phillip Johnston of The Telegraph wrote an excellent piece entitled “Secret trials: ‘Democracies die behind closed doors‘” which is well worth the read. It relays the real life horror of justice being used as a political weapon in modern day Britain. In another piece by The Bureau Investigates entitled “How do you prove you’re not a national security risk?” a man was sacked by the Home Office on ‘national security grounds’ without ever being told why or for what reason. Overnight, this man’s life lay in ruins with his lawyers arguing against the Government’s controversial use of secret evidence and closed court hearings. In a recent 150-page study, examining the use of secret evidence in a number of leading EU countries, state requests for evidence considered in secret on the grounds of national security was found to “significantly hinder” the judiciary system from ensuring fair trials. One has to remember we are discussing members of the European Union here, not North Korea. Commissioned by the European Parliament’s Committee on Civil Liberties, Justice and Home Affairs (LIBE), the report says the use of secret evidence undermines human rights and poses a “threat to the rule of law” in Europe. One shouldn’t forget that the Conservatives are aiming to scrap Human Rights laws as well. However, the UK’s Ministry of Justice today told the European Parliament it was “not the business of MEPs” to interfere with national security issues because these are the responsibility of member states alone. The report laid out particular criticism for the UK. One of the report’s authors said that Britain was a “worrying example of what can go wrong”. France, Spain, Sweden, Germany, the Netherlands and Italy all have secret courts, but it appears that not one of them have gone anywhere near as far as the UK in the systematic use of secret evidence in trials. Many people do not realise the widespread use of secret courts in the UK. They are commonly used in deportation and immigration hearings but also employment tribunals amongst many others. The Investigatory Powers Tribunal hears complaints about surveillance by public bodies such as MI5, the police or even local government—in fact, the only Tribunal to whom complaints about the Intelligence Services can be directed and hears evidence in secret. In one such case, Poole Borough Council were spying on a family to see if they were lying about which school catchment area they lived in. This is the only time the court has found against the authorities and the only reason we know about it. In these cases, the government department or agency asks the judge to present evidence to the court without the defendant even being granted access to any of that information or evidence against them. In a bizarre twist of irony, secret evidence may include material which has been gained via the illegal interception by the security services of the defendant’s communications, including that of conversations deemed legally privileged with lawyers, as in the case of Libyan Abdel-Hakim Belhaj, who was abducted by MI6 and the CIA and tortured in Libya. Alarmingly, the report also disclosed that there was an extreme lack of formal rules on the quality of admissible evidence. This meant that ‘hearsay’, evidence from a second or even third hand contact could be admitted with no confirmed source attributed as a means of validity. Here we are seeing the emergence of something far more sinister. 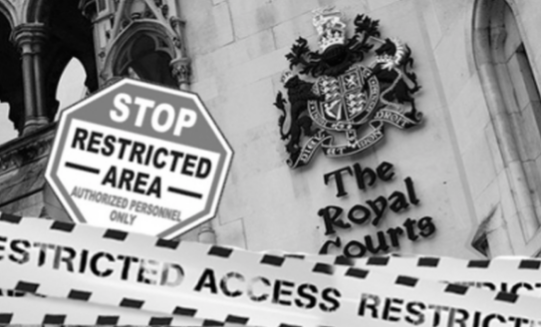 OpenDemocracyUK’s excellent article headed “Secret Courts: 8 nightmare scenarios” is also well worth the read because, as it has turned out, nothing is now conjecture or speculation: secret courts have expanded and covert evidence is used for them. In another rather shady piece of legislation, the law now allows police to present transcripts of indistinct audio they have listened to many times – in the role of a so-called “ad hoc expert” and present evidence as fact even though nothing distinguishable can be determined. In July last year, the then Justice Minister Chris Grayling published an extremely short report about the ‘closed material procedure’ which was clearly designed to tell us as little as possible about secret courts. We learn from the report that in five cases, the Secretary of State showed judges secret, undisclosed evidence. Yet nobody knows what these cases were, and even charities like Liberty have been forced to admit they don’t actually know which cases he’s referring to. We don’t even know if there are more cases. The European Courts have done nothing as the corrupt heart of Europe will always put big business over citizens’ rights. TTIP is evidence of this. The most controversial part of the deal is the Investor State Dispute Settlements (ISDS). These provisions essentially allow private corporations to sue national governments in guess what … secret courts.